The plume of volcanic ash over Europe was the cause of a very unusual situation concerning the Rules of Golf at the Comunitat Valenciana European Nations Cup this week. A cloud of ash from an Icelandic volcano shut down European airspace for several days, meaning that most of the 36 lady golfers, from 18 European nations, had great difficulty in getting to the venue in Alicante, Spain. There are multiple stories of how they travelled over land and sea for several days in order to be there for the start. It reflects so well on the players, their tour and the event. But the situation that interested me the most was one that I have not heard of before on any Pro Tour. Austria’s Stefanie Michl arrived in Spain on Wednesday night after a long and stressful journey from America. She eventually joined her compatriot Nicole Gergely just nine hours before her tee time. Unfortunately, her luggage and golf club were lost along the way. This is where the Rules situation arose. Stefanie and Nicole realised that they both use similar Titleist AP2 clubs and a Scotty Cameron putter and that the Rule 4-4b permits partners to share clubs, provided that the total number of clubs carried by them so sharing does not exceed 14. Amazingly, Michl birdied the 17th and eagled the 18th and the pair finished as joint leaders, at 6-under-Par, after the first day’s four-ball better ball format. Please don’t misunderstand Rule 4-4b. 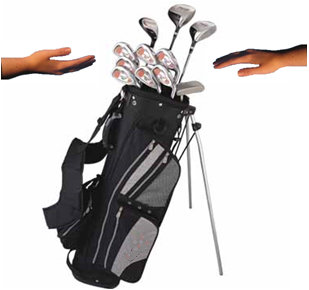 It does not permit you to borrow or lend a club during a round. It only applies to partners who do not have more than 14 clubs between them. I’ve had a great reaction to my new ‘Rhodes Rules School’ series of weekly emails that pose questions on the Rules based on an accompanying photo, or photos. Thanks to the more than three thousand subscribers. Don’t worry if you haven’t subscribed yet because you will not miss anything. When you do subscribe here you will start receiving the series of emails, one per week, starting from No.1. All new subscribers receive a small gift, a link to 27 Q&As on the Rules (9 easy, 9 slightly harder, and 9 more difficult), which you might like to use to test yourself and your Clubhouse friends. Of course, there is no charge and you can unsubscribe at any time. Here is the link again. Didn't know this. I thought partners were allowed to pull clubs from each other's bags. Remember the situation a couple of Ryder Cups back when Mickelson and Woods were paired together - first hole, Mickelson plants a driver firmly against the bush lined fence. There was talk about Woods being able to pull one of Mickelson's left handed clubs. "The player must not start a stipulated round with more than 14 clubs. He is limited to the clubs thus selected for that round, except that if he started with fewer than 14 clubs, he may add any number, provided his total number does not exceed 14. The addition of a club or clubs must not unduly delay play (Rule 6-7) and the player must not add or borrow any club selected for play by any other person playing on the course." I presume that the TV commentators that you heard must have been joking. In four-ball stroke play, Sally's clubs were locked in the car (keys too). So she and her partner, Janie, shared Janie's set of 14 clubs. In the middle of the round, the pro came up and brought Sally's set from the car trunk but the women refused to play with them saying that this would mean that Sarah had played a round with 28 clubs. Were they correct or could they have then reverted to their own clubs? They were right to limit themselves to the 14 shared clubs. If Sally had subsequently used any of her own clubs she would have had use of more than 14 clubs during the stipulated round. Only the player borrowing the club is penalised under Rule 4-4a; in match play they lose the hole as soon as they make a stroke with the borrowed club.